We have recently returned from travels to North America, Europe and Asia inspecting properties and meeting with numerous REIT management teams and other property market participants. Overall, the mood in most markets remains positive thanks to stable if not increasing levels of tenant demand, which is matching if not outpacing building supply. A flurry of M&A activity has also lifted spirits in the troubled retail landlord sector. Rising official interest rates, notably in US, Canada, Hong Kong and UK, do not seem to have had a discernible impact on REIT markets. The recovery of corporate earnings is seeing some rotation out of the REIT sector. The market’s attention, at least while we were travelling, is not yet caught by the flattening yield curve. The House of Europe’s economic resurgence appears to be gathering pace with the Paris office market – Europe’s largest – a key beneficiary. There appears to be no single winner from the few tenants (such as European agencies) relocating from the UK, with Paris, Frankfurt, Amsterdam and Dublin thus far sharing the major spoils. The UK remains on Brexit and Corbyn tenterhooks. Tenant inquiry in London is moderating but not lifeless with limited signs of businesses fleeing across the channel (apart from the EU agencies). That said, investment banks are growing their European presence at a greater rate. London rents are showing signs of cresting largely thanks to a meaningful building supply response – particularly in the City – after a significant surge in rents. In North America, coastal markets continue to shine, particularly the West Coast but we found surprising vibrancy on our trip to Austin, Texas which is developing as a meaningful tech centre thanks to a skilled workforce and some cost and availability pressures in San Francisco and Seattle. Austin must be firming in the betting market as a candidate for Amazon’s HQ2, particularly in light of recent proposed changes for State and Local Taxes (SALT) which effectively dissolve federal relief in high personal tax states such as New York and California. We found little evidence of widespread REIT ill-discipline in relation to investment strategies or capital management. REITs are generally deleveraging, passively (not increasing debt at the same pace as earnings or valuations) or actively (by selling real estate). This is despite plentiful availability of long term low interest rate debt which could boost short term earnings. After lessons learned from the Global Financial Crisis (GFC) it seems the REITs are abiding by the saying “fool me once shame on you, fool me twice shame on me” (although we liked George Bush Jnr’s version which you can find on YouTube). We expect the unwinding of QE and rising interest rates will test markets in general. Real estate pricing is challenging for seasoned investors who know the good times don’t last forever, but current dynamics suggest they could persist for some time yet. Our greatest concern centres on tenant credit. Most REIT managers we spoke with were experiencing historically low levels of bad debts and high occupancy. Given ultra-low interest rates and generally growing economies this should not surprise but we question the ability of unproven or highly leveraged businesses in general to withstand an increase in rates – many have survived because there is limited opportunity cost so why not let it ride. Of course retail has been the greatest area of concern and has already witnessed tenant credit issues with only a modest recent rise in finance costs. Nevertheless, the elevated anxiety we witnessed earlier in the year associated with the retail sector has been overshadowed by M&A activity and shareholder activism. Initial attention was directed to the US malls, with General Growth Properties receiving a bid from Brookfield to acquire the remaining 66% of shares it does not already own. Activist investors Third Point and Elliott Management have also appeared on the registers of Macerich and Taubman respectively. Then, UK listed mall landlord Hammerson was coerced (in our opinion) into making a scrip bid for Intu Shopping Centres, one of the “laughing stocks” of the industry. Intu has been a perennial underperformer and a recalcitrant in terms of substandard property investment and capital management practices. Pity its long suffering investors. In 2010, Intu rejected a cash and scrip bid by Simon Property Group for £4.25 per share, claiming the stock was worth over £6. Hammerson’s current all scrip bid values Intu at little more than £2.50. Subsequently, and perhaps most significantly, Westfield Corporation* announced its board has agreed terms to be acquired by Unibail Rodamco in a move to create the pre-eminent mall company owning iconic shopping centres in New York, London, Paris, Milan, San Francisco and Los Angeles (among others). The deal appears to be an early Christmas present for patient supporters of Westfield, mall REITs globally and A-REITs generally. We count ourselves among this list but to us the price isn’t exceptional – largely scrip and only a slight premium to Net Asset Value (NAV) for an exceptional portfolio. We hold overweight positions in both companies in our global portfolio and had used recent weakness in the listed retail landlords to reduce our underweight position to the sector. With the Lowy family (largest private shareholders) supportive, it seems probable the deal will consummate. A competing bid appears difficult to execute but not out of the question given the quality of the assets. So it’s arguably the end of an era but we will save the reminiscing for a later note. Unibail Rodamco is not a household name outside Europe and its malls are not branded. Indeed as part of this transaction it plans to brand its own flagship malls “Westfield” – recognition of Westfield’s iconic standing in the industry. Readers of our quarterlies over the years will know we are admirers of Unibail (pronounced “ooni-buy”) – numerous property inspections and meetings with management have confirmed our view that they are by far the best in Europe and amongst the top three mall operators in the world. *Note that Westfield Corporation divested all of its Australian and New Zealand assets in 2014 to ASX-listed Scentre Group (SCG). While the Australian and New Zealand assets retain the Westfield brand, they do not form part of the Unibail Rodamco offer for Westfield Corporation. While the Lowy family have stated their intention to maintain a substantial investment in the merged entity, it is significant that they are taking some chips off the table at this point in time when the share price of listed mall REITs have been under pressure from the structural shift in consumer spending patterns due to the growth in ecommerce. Nevertheless, flagship malls remain close to fully occupied as retail brands see high-traffic locations as an important channel to interact with customers. Casual dining remains an important growth category in malls. A number of vibrant retailers that have managed to unlock shopper wallets (Sephora, Lululemon, Apple, Adidas and Louis Vuitton amongst them). 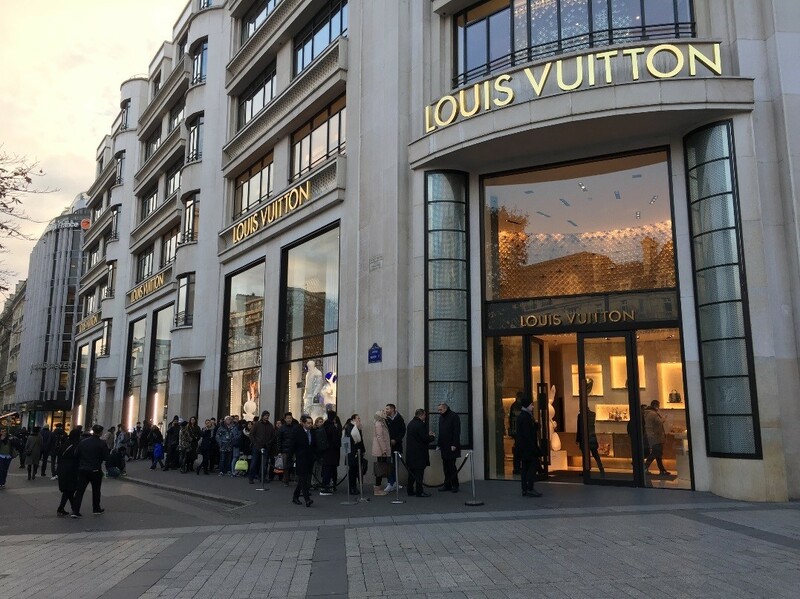 On our trip to Paris in the first week of December we took this photo of the Louis Vuitton store on the Avenue de Champs Élysées. If bricks and mortar retail is dead, someone forgot to tell these people lined up in near-freezing conditions that they could buy on-line. Co-incidentally the building is owned by French listed REIT, Gecina, a portfolio holding. We acknowledge the retail environment is challenging and there seems little optimism that department stores will return to their glory days. How these massive but low-rent paying stores will be repurposed is occupying the minds of landlords. Perhaps the most significant change is that we are seeing more residential, hotel and office components added to malls recognising the limited demand for substantially more retail space but more significantly recognising the strategic locations in increasingly densely populated urban areas. Amazon’s acquisition of the Whole Foods grocery chain (and similar deals by Alibaba in China) is seen as proof that physical stores in some retail categories remain the most effective form of last mile delivery – time sensitive, low margin, small basket transactions remain beyond delivery systems and technologies. The area of greatest tenant demand and robust rent growth is in the logistics sector with what is being described as a supply chain revolution (not to be mistaken with paradigm shift!). Based on valuations, investor interest in the space also appears equally enthusiastic. This has underpinned high levels of activity at port cities such as Hamburg and L.A. which are major beneficiaries of the ongoing economic growth of Germany and the US respectively. It would seem this dynamic has some way to play out but it is questionable how sustainable this trend is. Why wouldn’t consumers have goods delivered effectively free to home? Something has to give. Walmart’s decision to increase on-line prices underscores this reality. It seems surprising to us that more Germans don’t own their own home. With rental yields of close to 3% and cost of debt 2% or less, in effect you are being paid to buy versus rent. So why is the home ownership rate less than 50%? It seems Germans have a greater appetite for a nice Audi and have very strong protections as renters (capped rents and right to lease renewal). But for most, income levels are too low to meet lending standards or save a minimum deposit. German housing also wasn’t seen as an investment vehicle for savings as nominal house prices didn’t grow for 20 years 1990-2010 and went backwards in real terms. What has become increasingly apparent to us is Australia’s potential vulnerability to variable interest rate residential mortgages. In countries such as Germany and the US, home buyers lock in fixed interest rates from at least 10 years to the life of the loan. 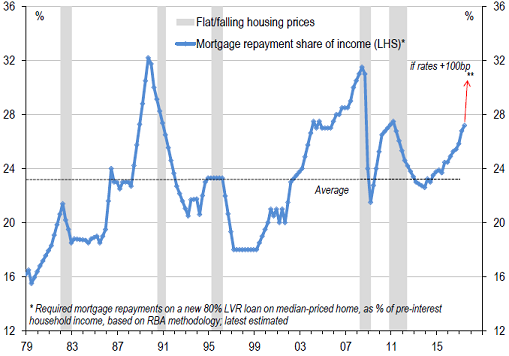 By comparison, only 18% of Australia’s housing finance is subject to a fixed rate, with the longest term being 5 years. Given the trend of generally falling rates over the past 20 years, Australian borrowers can be forgiven for not seeing the benefit of fixed rates, even if it was only for 3 to 5 years. Whilst REITs seem to have collectively heeded the lessons of the financial crisis – maintaining leverage at lower levels and fixing interest rates for longer term, the same cannot be said for Australian residential mortgage holders. With high household debt levels and high home prices it seems to us that Australia is particularly vulnerable to a changing interest rate environment. And it may not be for reasons on the domestic front, with Australian mortgage providers relying significantly on offshore borrowings. The recent move to curb interest-only loans has had some dampening impact on the market which could well be a minor challenge compared with rising interest rates generally. We note interest rates did spike during the GFC but only briefly and when household debt and house prices were materially lower. Retail sales were impacted but it is hard to separate the whirlwind of events at the time and point to specific cause and effect. Bottom line, the Australian residential market seems vulnerable to external shocks. Over the past 20 years economic conditions have proven supportive thanks to a resources investment boom, China’s fiscal stimulus during the GFC and overseas central banks lowering interest rates to cushion damaging forces in their markets (sub-prime, the PIIGS debt crises). We should be so lucky over the next 20 years! One of the key topics we identified on our travels were rising construction costs. As we observed earlier in the year, the geographically widespread increase in building activity remains evident. Urban residential supply continues to dominate but, with the exception of retail – commercial building activity is returning to the long term norm. “Normal overall” also includes pockets of excess – e.g. those most at risk include London City and Tokyo office as well as seniors housing and self-storage in the US. When combined with infrastructure projects, the increased activity is starting to manifest itself in skilled labour shortages, pressure for contractors and increasing construction costs. In New Zealand, Fletcher Building recently reported significant losses on a number of projects because of these conditions. Germany and some markets in the US are experiencing mid to high single digit building cost inflation with France also starting to see real cost increases. In our travels, REIT management teams commented that supply has been delayed because of issues with builders. For real estate investors this is a good sign, indicating replacement costs are rising which in turn requires higher rents to justify development. Hence, real estate could well serve its reputation as an inflation hedge. That said, we expect technology advances will mean this dynamic is temporary. Skilled labour shortages and slow release of land and some curbing of bank finance for development is creating supply bottlenecks driving up the economic rent required to justify new construction. Hence, real estate is promising to act as an inflation hedge provided economic growth is sustained. The UK is in a more challenging position, anxious about the state of its building industry, unsure of the impacts on tenant demand of Brexit whilst, on the other side of the equation, keenly aware that 30% of its construction labour force is derived from the Continent. Land prices are also elevated with many REITs not actively seeking to fully replenish land banks as they deliver developments. Indeed many are looking to drive greater yield out of existing sites through greater density. With low interest rates meaning negligible holding costs for non-income producing assets, there is little incentive for long term land owners to sell as values continue to increase (forget about value, enjoy the momentum!). Another common topic of our discussions with REIT management is some high prices paid for real estate which implies that the REITs are trading at material discounts to underlying property values. We must be careful not to use these transactions as confirmation of sustainable market clearing prices, particularly as transaction volumes do seem to have dampened in 2017. Nevertheless, we have still seen major transactions in most markets and sectors at levels which suggest there is a spread between listed and unlisted prices. In Australia, AMP’s acquisition of Indooroopilly shopping centre at a yield in the low 4% range raised eyebrows whilst a private equity consortium acquired a portfolio of Link REIT’s non-core shopping centres in Hong Kong at a 2.8% yield (a 50% premium to book value). Recent office deals in Frankfurt, London, Paris and Sydney at record prices also point to a pricing-disconnect. Of course persistently wide discounts to NAV will ultimately narrow. Either the listed market will prove to be a leading indicator of future declines in property values, or M&A activity, such as that which is currently occurring in the mall sector, will see REIT prices rebound. In the meantime we will leave you with a novel idea. For the impatient or for sceptics who believe listed real estate is not real estate, there is a solution. Let’s call for REITs to delist in 2018. Values of formerly listed but now unlisted portfolios will increase 10-20% as they are valued at NTA/NAV. The argument that listed REITs are more volatile will immediately be nullified. Of course there will be a flood of money chasing these headline returns which will offset any misguided investors who decide to redeem their previously “volatile” investments. And if the redemptions exceed the applications we will simply suspend redemptions because surely that would be in investors best interests rather than discounting unnecessarily!! So from all of us at Resolution Capital we thank you for your support and for constructively challenging us. We wish you a safe and happy festive season and sensible investment returns for the 2018 spin around the sun. Andrew, Marco, Rob & Jan. This communication was prepared by Resolution Capital Limited (“Resolution Capital”). The information in this communication is for general information purposes only. Information in this communication is not intended as a securities recommendation or statement of opinion intended to influence a person or persons in making a decision in relation to investment. This communication has been prepared without taking account of any person’s objectives, financial situation or needs, and because of that, reliance should not be placed on the information in this communication as the basis for making an investment, financial or other decision. Any opinions or forecasts reflect the judgment and assumptions of Resolution Capital and its representatives on the basis of information at the date of publication and may later change without notice. Any projections contained in this communication are estimates only and may not be realised in the future. Returns from investments may fluctuate and past performance is not a reliable indicator of future performance. Resolution Capital believes the information contained in this communication is reliable, however no warranty is given as to its accuracy and persons relying on this information do so at their own risk. Unauthorised use, copying, distribution, replication, posting, transmitting, publication, display, or reproduction in whole or in part of the information contained in this communication is prohibited without obtaining prior written permission from Resolution Capital Limited. I confirm I have read and understand the Disclaimer. Your privacy is important to both Pinnacle Investment Management and Resolution Capital and we are bound by the current Australian privacy legislation. Click above to view our Privacy Statements.